“The Phantom Zone” begins with Brainiac surveying Kandor as his massive ship begins the bottling process. With the protective dome down the city is exposed to the harsh Krypton environment. Seg and Nyssa run into General Zod and Lyta. Zod tells them that they need to return to the Fortress of Solitude to bring back Seg’s grandfather Val-El. It turns out that Val secretly send himself into the Phantom Zone when he was being executed. Val and Zod spent a lot of time together in the Phantom Zone before Zod took Val’s activator fob and escaped the Phantom Zone. 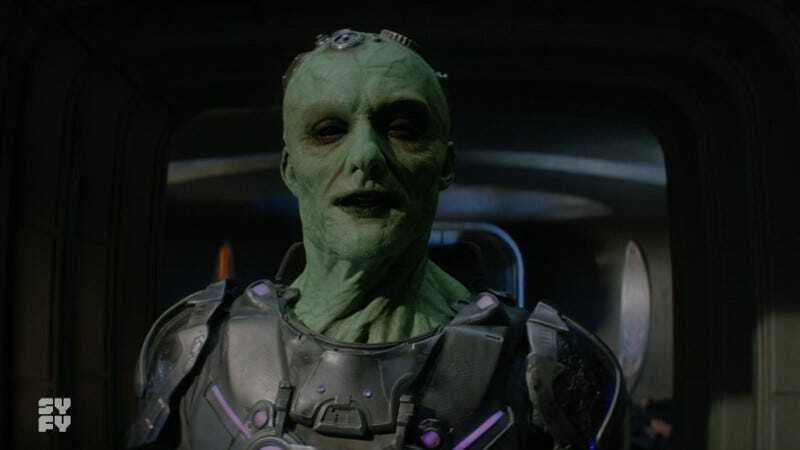 Val has been studying Brainiac and if anyone knows how to stop Brainiac it will be him. Zod enters the Zone and returns with Val. But Val hasn’t seen a possible future where Brainiac is stopped. Lyta and Nyssa sneak back into Kandor for different reasons. Lyta puts her uniform back on and takes command of what’s left of the Sagitari with Dev-Em at her side. She sends out the Sagitari to attack but Brainiac doesn’t even break a sweat destroying the force. Lyta is devastated but her actions bought time for people to evacuate the city. Nyssa goes to the Genesis Chamber to get the fetus of her and Seg’s unborn child. She runs into Jax-Ur who is there to retrieve the Codex. Jax-Ur sees Nyssa as no different from her father but realizes that the younger Vex doesn’t really know everything her father was doing. Jax-Ur reveals that Nyssa is actually a clone. The original Nyssa died from injuries sustained in the same skimmer crash that killed Nyssa’s mother. Zod tells Seg that the best chance to save Kandor and Krypton (remember the taking of Kandor will lead to Krypton’s destruction) is to offer Brainiac Val-El and his knowledge of the future in exchange for leaving Kandor alone. Seg isn’t too thrilled with the idea. Zod leads Brainiac to the Fortress of Solitude to get Val. But Seg has set up a trap. He uses Holo-Val to lure Brainiac into position to be sucked into the Phantom Zone. Before the portal closes though Brainiac grabs Seg with a tentacle and pulls him into the Zone as well. Val tries to open the portal to the Zone to save Seg but Zod shoots up the controls, trapping Brainiac and Seg. Brainiac has been stopped. Kandor and Krypton have been saved. But Superman’s cape has changed. It’s whole again but now it has the sigil of the House of Zod. Oh, and somewhere under Kandor Doomsday is breaking out of his container. I’m looking forward to next season. We see that Adam Strange was teleported to one of Brainiac’s bottled cities. During the zoom into the city a U.S. flag is clearly visible on a flagpole atop a building so Adam seems to be in an Earth city Brainiac takes in the early 21st Century. And then there’s that giant Zod statue. If Seg is General Zod’s father, how is Zod still around? I assume the explanation is the Genesis Chamber. Will we see a baby General Zod alongside the adult version? Or should we not get too wrapped up in the rules of time travel? For all practical purposes Clone Nyssa is Nyssa-Vex. She has all of the original’s memories and except for maybe some epigenetic differences she is the same physically. I get that in Jax-Ur’s eyes Nyssa is the physical embodiment of what’s wrong with the guilds and the ranked caste system but Nyssa being a clone still seems like a random thing to throw in. Jayna-Zod is still missing and I’m guessing presumed dead. But I’m pretty sure she’ll be back to finish that duel and deal with her daughter. Daron-Vex is currently also in the “missing, presumed dead” category but we haven’t seen a body. He seems like the kind of survivor who will turn up again like a bad penny. Anyone Else Still Watching Krypton? Will Krypton Or Supergirl Give Us A Kryptonian Nightwing?